In many cases the painter’s paint brushes are one of the most important painting item in their gear. While tubes and paints are all very similar, and pads are all nearly the same, once a painter has gotten used to working with a specific brush it becomes part of his hand, and part of his way to create art. For this reason it is important to to store the brushes inside a canvas roll up paint brush holder, to make sure they are protected and safe. While painters usually have dozens of brushes, they are able to recognize within the pile 3-4 brushes they like to paint with best. Older brushes are favored over new ones once a painter get the right ‘feeling’ with them. If those brushes are mishandled when they are stored or carried they will begin to loose shape, get mold, have hairs fall off and eventually find their way to they trash. In order to prevent this from happening they need to be cleaned and stored in a correct manner. Make sure your brushes are cleaned after each use. This is true for any medium you are using, but especially true for acrylic paints and oil paints. Once brushes are clean, they should be left to dry on a clean flat surface. A canvas roll up holder is a good place when it is placed flat open on the table. Brushes should be stored in a dry ventilated place, a box with holes or a canvas roll up brush holder are the best places to keep them safe. For expensive brushes keep their tip cap on, this would be the plastic sleeve they have to protect their tip. Carry them around when they are safely stored. Watch the short clip below to learn more about the premium canvas roll up paint brush holder. Purchase your premium Rigger Art paint brush holder roll up here. Most painters have a neat canvas roll up wrap to keep their gear organized. The idea is once the brushes are cleaned to store them on a flat surface to air dry. It is not recommended for the brushes to be left to dry upright because the water left in the turf will drip into the ferrule and cause mold on wooden handle. When the brushes are dry, painters roll them up inside the wrap and either store them or take them on the go. The wrap can be used also as a tidy place on the painters desk to organize the brushes for another painting. When the brushes are 100% dry you can store them upright with no issues. If there are several expensive fine tips in your pile, make sure to place the protective sleeve cap over the tip to protect the brushes even when they are in the wrap. Click here to check latest discount and get a canvas roll up holder for your brushes. The premium brush paint canvas roll up has 22 pockets, for long or short handle paint brushes and two wide pockets at the side, so those painting with wide brushes could store them in organizer as well. With thick durable canvas the brushes are well protected in studio, bag or for plein air painting anywhere you go. 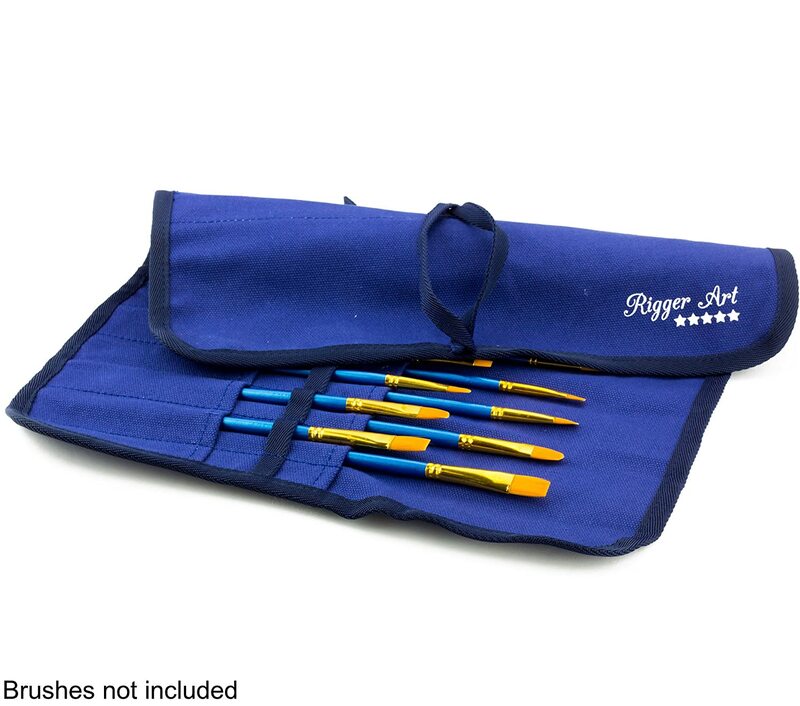 This entry was posted in Paintbrush Holder and tagged Brush Organizer, canvas brush holder, paint brush holder, Paintbrush Canvas Roll Up, Paintbrush Holder Case, Paintbrush Organizer, Plein Air Painting, Short Handle Paintbrushes by RiggerArts. Bookmark the permalink.